IMPORTANT UPDATE: The upcoming Segwit2x fork has been canceled according to an announcement made on November 8th 16:58:41 UTC. 1.Prior to August 1, 2017, miners activated the backward-compatible SegWit soft fork. This upgrade to the Bitcoin protocol increased the transactional capacity of blocks, fixed a serious bug known as transaction malleability, and paved the way for Lightning Networks and further improvements. 2. On August 1, the backward-incompatible Bitcoin Cash hard fork occurred. Bcash split from the main Bitcoin blockchain to create an altcoin with 8-megabyte blocks and no SegWit implementation. All Bitcoin balances held at fork time were credited an equal amount of Bcash (BCH). See our Bitcoin Cash article for more details. 3. On October 24, the backward-incompatible Bitcoin Gold hard fork occurred. Bitcoin Gold hard forked away from the main Bitcoin blockchain to create an altcoin with an altered, ASIC-resistant mining algorithm known as Equihash. All Bitcoin balances held at fork time will be credited with an equal amount of Bgold (BTG) when the Bgold network launches (presumably in the near future). See our Bitcoin Gold article for more details. 4. The SegWit2x (also known as S2X/B2X) backward-incompatible hard fork is scheduled to occur around November 16. B2X will fork from the Bitcoin blockchain to produce an altcoin with 2-megabyte blocks and SegWit support. All Bitcoin balances held at fork time will be credited with an equal amount of B2X. See our article on the New York Agreement (which set the stage for SegWit2x) for more details. The SegWit2x fork is scheduled for Bitcoin block 494,784, which will be mined sometime around November 16, 2017. For an updated projection of the date and exact time of the mining of block 494,784, visit the 2x Countdown page. From a Bitcoiner’s perspective, SegWit2x is an attack by big miners and corporate interests, and it’s intended to seize control of Bitcoin development. It’s perceived as an attack primarily due to its lack of consensus and replay protection, which will almost certainly lead to chaos, confusion, and losses. Statements from the S2X team clearly indicate that S2X is intended to replace the existing Bitcoin. Bitcoin Core and other key developers who’ve stated their opinions about SegWit2x are listed here (all are unanimously against it). Former Core dev and Bloq CEO Jeff Garzik is the sole SegWit2x developer. Garzik has been criticized for simultaneously working on yet another ICO altcoin called Metronome. SegWit2x was cloned from Bitcoin Core 0.14. Although Core’s latest version, 0.15, has been patched against a node-crashing exploit (disclosed by Chris Jeffry at the Breaking Bitcoin conference [2:29]), the SegWit2x client (known as btc1) remains vulnerable. 83% of blocks currently signal their miners’ support for the NYA. Stats from Coin.Dance. However, bear in mind that signaling is fairly irrelevant in this context. Signaling for Emergent Consensus (also known as the Bitcoin Unlimited fork, which failed to launch) reached 45% without effect. Adding a signal to each block mined costs miners nothing (and may even earn them extra money, if S2X supporters are willing to pay), so it shouldn’t be considered a reliable indicator. What ultimately matters is which chain miners will mine; all indicators point to this being the chain with the most value (the majority of users and economic activity). This is highly unlikely to be the S2X side. Bitfinex’s current price for B2X futures against Bitcoin is 14.5%. 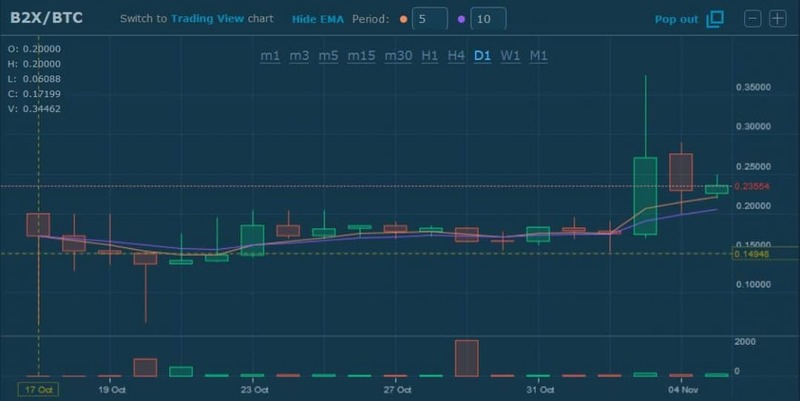 HitBTC’s current price for the B2X future against Bitcoin is slightly higher at 23%. Exrate’s current price for B2X futures against Bitcoin is 15%. Note: The Bitcoin network may be slow if there’s a rush of people moving coins before the fork. It’s recommended that you send your coins well in advance for a reasonable fee. Note: It may take some time for wallets to implement proper solutions. In the meantime, the price of B2X tokens may move against you. Note: This is how the situation stands as of November 6, to the best of our knowledge. More exchanges are expected to announce their positions going forward. Check back for updates to this article. Hard forks are like this; they don’t leave a duplicate blockchain around to get hacked by the NSA. Always use S2X addresses (freeWallet had Segwit 2 X implementation first) and by doing so you will save time and transaction fees. Apparently you didnt get the memo. Yeah……well…..as SegWit2x was just canceled today, this is all moot. No more segw2x…. just posted. The 2X has been shut down. Hi Steven. great article. If i keep my bitcoin in Ledger, do I understand you correctly, that I may not receive the Segwit2x coin at all if Ledger does not support it? I am a newbie so please forgive if I ask something stupid. Also, are you concerned about miner attacks that render Legacy Bitcoin worthless? Hey Steven, thank you again for your excellent article. Can I follow up on Carla’s query and ask whether or not Coinmama will be supporting B2X please? Also, how about GreenAddress? Any idea which way both of these will go please?